It was a night of heartbreak for some drivers and good fortune for others in the Outlaw Midgets Race Club at Sunset Speedway on August 18, 2018. The #5 Jody Bound won both heats, but alas it was too much for the little engine that could dominate and it expired just a few laps into the 25 lap main feature. This left the door open for some of the other fast racers to capitalize on Bounds misfortune. A handful of cars had brake issues and had to pull off to keep the #5 company in the Field of Broke Dreams. With Spiderman in the house, another Super Hero was to rise up and “steal” the victory. The #53 of Mike Bradley championed his speedy car through the various villains of Midget Mayhem to capture the Checkered Flag and the claim his first feature victory. With Bradley Brothers Racing’s Crew Chief Russ Bradley cheering on and Car Chief Jo Bradley nervously watching with Chief Car Tuner Tom Bradley, The #53 Dayco Sponsored car fought valiantly with the likes of the dastardly Woodland Brothers #48 Brian Woodland and #84 Richard Woodland, The Flying, No Horned, Purple People Eater of #62 Rob McCall, and the Dark Knight of #37 Steve Lassman, through the 25 laps of organized chaos. 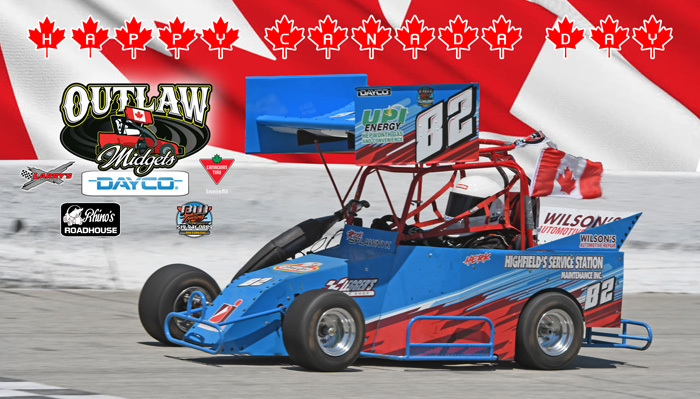 Congratulations to the Outlaw Midgets Race Club on another fine showing at Sunset Speedway. Thanks to all the Drivers, Staff and Volunteers for their time. …And Especially a HUGE Thanks to the Fans that support Local Short Track Racing. YOU make this all possible. Click the Thumbnail Above to see all the August 18, 2018 Outlaw Midget Action. Hot temperatures (Only mildly warm for Me) were the thought of the day as the Outlaw Midget series took to the track. No one was doing the Sauble Wobble on this day. The Cold Beers would have to wait. With a smaller field of cars, but a stout field none the less, the Racing started with 2 pretty exciting Heat Races. Heat #1 saw #5 Jody Bound start a new win streak and Heat #2 saw the #24 Ryan Brown out pace the others for the Checkered Flag. After his unfortunate DQ the previous day, #5 Jody Bound proved to everyone, that it was just motivation for his Larry’s Small Engine sponsored Midget racer. Bound drove like the proverbial pissed-off teenager to trounce the field for the feature win. Congratulations to All the Outlaw Midget Racers for an Excellent Race Weekend. Racing has always been a Family Affair, Click on the thumbnail of Team Homewood to see all the Canada Day July 1 pictures. An almost Perfect weekend, on and off the track. It was ALMOST Perfect for the #5 Jody Bound too. During the main event, Bound was involved in an early lap incident that saw a few cars spin and make contact. Bound, with damage to the #5, left the track to repair and after re-starting at the back, came through the entire field to “win” the event. He was later disqualified, handing the Victory to the #62 of Rob McCall. The #5 Jody Bound has continued his perfect Outlaw Midgets season in 2018 at Full Throttle Motor Speedway @ Varney. And… He did it without Car Owner Larry Wilson present. Larry was Yachting Around the World, Playing Baccarat with Members of Spectre, While saving the Plant From Evil Forces. (He’s THAT kinda guy). Bound had two heat wins and the Feature. The other heat wins went to #84 Richard Woodland. Thanks go out to Full Throttle Motor Speedway @ Varney for an entertaining evening of racing with the ever present threat of foul weather. They put on a rather interesting 3-car chain race that has Teams of 3 cars attached with chains that race around the track for the Checkered Flag and Bragging rights. It was different. Congratulations to ALL the racers on a Fine Performance. Click the Thumbnail above to see All the Outlaw Midget Race Action before You Get “The LOOK” from Young Tom. Happy Fathers Day to All Dad’s Everywhere. Sadly, I lost my Dad in 1996, but not a day goes by that He doesn’t influence my decisions. 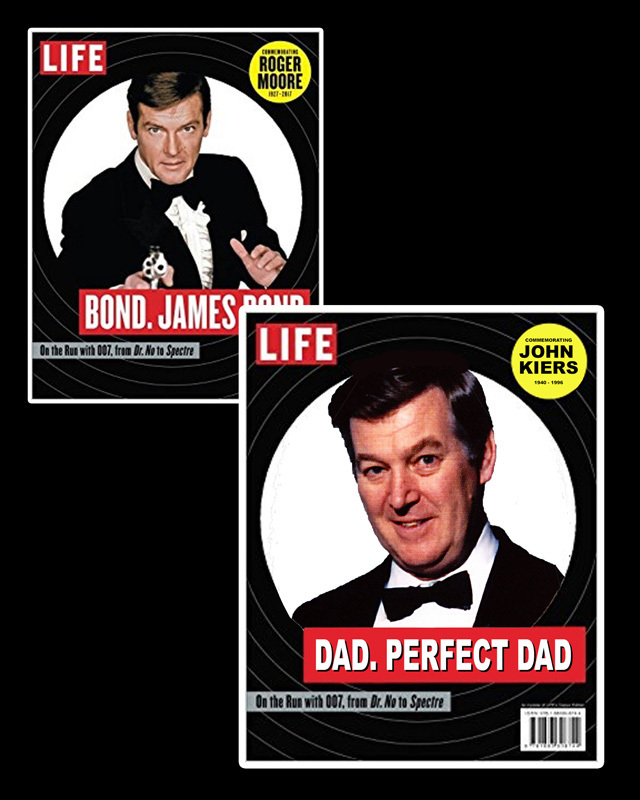 I always thought He looked like Roger Moore (Bond, James Bond) in his Tuxedo. I miss and Love You Dad. Spending Fathers Day Weekend at Flamboro Speedway, it doesn’t get much better. Congratulations to All the Race Winners. Click on the Thumbnail to See more Winners and All the Flamboro Speedway Race Action. Yep, I’m a Lucky Guy. One of the bonuses of traveling with the Outlaw Midgets is I get to go to tracks see some Old Barrie Speedway and Sunset Speedway faces, and meet some new faces, as well. There are far too many people to name personally, but a few stand out. Jerry Abramowicz, Eric Uprichard, Ashley McCubbin, Brian Watts, and Mike Walker. Not only that, I get the best seat in the house for ALL the Great Racing Action. Chicken Dance along with Another Favourite Fun Person in Photographer Debbie Jo Zardo and Click on her to see all the Sunset Driver Action From June 9, 2018. The #5 Jody Bound undefeated streak remained alive on this night. Bound has continued his perfect season winning both heats and the feature at Sunset Speedway, June 9, 2018. With a solid field of Outlaw Midgets the competition was high and certainly no cake walk for Bound. Other heat winners included #69 Wally Wilson and #1 Nigel Buttivant. Click the Thumbnail to see all the Outlaw Photos from June 9, 2018. Week 2 of the Outlaw Midgets Series sees the #5 of Jody Bound, determined to go the Full Season undefeated. Full Throttle Motor Speedway @ Varney was no exception as the defending series Champ is now a perfect 0 for 6 in races. Bound has won every heat and feature race in 2018. #2 Jessica James had a heat win and the Brown had the other heat win. Congratulations to All the Racers on a Great Evening of Fast Outlaw Racing. Join Us at Sunset Speedway on June 9, 2018 for more Outlaw Midget action. Hope to See You There. Opening night jitters for some, Relief that the season has started for others. Flamboro Speedway finally got some Lovin’ from Mother Nature for Mothers Day Weekend and night one is done.